Dumbledore's Army (also known as the D.A.) was a secret organisation initiated by Harry Potter, Hermione Granger, and Ron Weasley to teach their fellow Hogwarts colleagues proper Defence Against the Dark Arts in 1995. It was founded by Hermione, but taught and led by Harry. Magical Creatures was a club at Hogwarts School of Witchcraft and Wizardry for students with an interest in magizoology. Meetings took place Wednesday and Thursday from 5:30 to 7:30, and attendees were invited to bring their pets, in order to learn more about them. The club promised to show more than 40 creatures in a month. 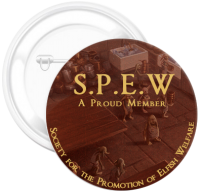 The Society for the Promotion of Elfish Welfare (S.P.E.W.) is an organisation founded by Hermione Granger in response to what she saw as gross injustice in the treatment of house-elves. Hermione Granger thought it cruel that house-elves were neither paid nor given holidays for their work, so she campaigned tirelessly for a change in their working conditions.